A science fiction action thriller exploring human cloning, The 6th Day has enough smarts on display to overcome the more formulaic aspects of a Schwarzenegger big-budget movie. In the near future, cloning company Replacement Technologies is peddling cloned pets, but the cloning of humans is still considered illegal. Adventure helicopter pilots Adam Gibson (Schwarzenegger) and Hank Morgan (Michael Rapaport) get tangled up in an assassination plot by anti-cloning activists targeting Michael Drucker (Tony Goldwyn), the CEO of Replacement Technologies. Adam is shocked to discover that he now has an illegal clone who has already moved in with his wife Natalie (Wendy Crewson) and daughter. Adam finds himself on the run and chased by Drucker's security chief Robert Marshall (Michael Rooker) and assassins Talia (Sarah Wynter) and P.Wiley (Rodney Rowland). As Adam delves into the mysterious goings on at Drucker's firm, he discovers a fully functioning illicit human cloning operation, using the methods of head scientist Doctor Griffin Weir (Robert Duvall). Drucker has ambitions to control the levers of world power by influencing politicians through cloning and perpetuating life according to his whims. Adam has to find a way to get rid of his clone and expose Drucker's plot before his family is destroyed. 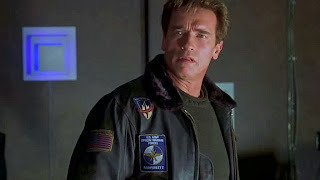 The 6th Day suffers from the normal excesses present whenever Schwarzenegger is cornered into unleashing a destructive on-screen rampage. But the car chases, fights, shoot-outs and explosions are kept within reasonable control by director Roger Spottiswoode. To the extent possible the story remains at the centre of the movie, and the examination of cloning and its possible implications is afforded the required space. Presenting pet cloning as a generally accepted retail activity is a clever entry point. After all, it's difficult to confront the tears of a grieving child knowing that dead pooch can be cloned at the mall and brought back home healthy in a couple of hours. From there it's a short jump for the Cormac and Marianne Wibberley script to make the argument that human cloning can bring back loved ones from terminal diseases, preserve brilliant minds to enable future discoveries, and save children from being orphaned. Young, brash and smart, Michael Drucker knows that legal or not, there is a growing demand for his product, and it's only a matter of time before the laws are overturned. Drucker mainly cares to be in control of the market and its implications, a quick metaphor for cloning allowing humans to effectively play the role of God, will all the mindbending implications that follow. The question of who lives forever and who dies forever lands in the hands of those who control the technology, and society is far from ready to grapple with the resultant ethical conundrums. And when things go very wrong, as they do when Adam Gibson finds himself coexisting with his clone, the available solutions all appear ugly. Amidst all the good-guy, bad-guy, bland-wife stock characterizations, Robert Duvall offers up the only nuanced performance. His Doctor Griffin Weir is interested in the science and not nearly as concerned with the morality of cloning. But there is a hint of an uneasy soul within Weir as he observes what the likes of Drucker are capable of. When personal disaster strikes, the doctor reaches the end of his ability to facilitate megalomania. The 6th Day enjoys attractive Vancouver locations, and within the confines of the action genre, delivers discerning entertainment in a glitzy package. For a movie with not one but two 53 year old Arnold Schwarzeneggers, that's as good as can be hoped for.